Photo mosaics look beautiful if they use small enough images or if you are have enough distance to the mosaic to enjoy it fully. The mosaics are called photo mosaics because photos and images are used to create the mosaic and the image it displays. Computers have made it easier to create photo mosaics and the website Pic Artia provides an online script that can create a photo mosaic from an image that you upload from your hard drive or select from a server on the Internet. The process of creating the photo mosaic could not be easier. Three steps are needed to create it. You upload the image that you wants to create a mosaic from in the first step. The second step provides several themed photo galleries like Tokyo, Bikinis and Faces that you need to pick one of. One photo gallery is selected to create the photo mosaic. The third step finally processes the image and creates the photo mosaic. You have to enter your email address because the information about the photo will be send to that email address. The @ sign has to be entered as if your keyboard would be using an English layout, that is Shift 2 for the @ sign. The server seems to be a bit overrun currently and returns a bad bad message during conversion frequently. The only tip that I have is to either try again at a later time, try another image or reduce the output size of the image. Update: The service does not seem to be available anymore. An alternative service that you can make use of is Easy Moza, a free online mosaic creating service that is offering a similar set of options. 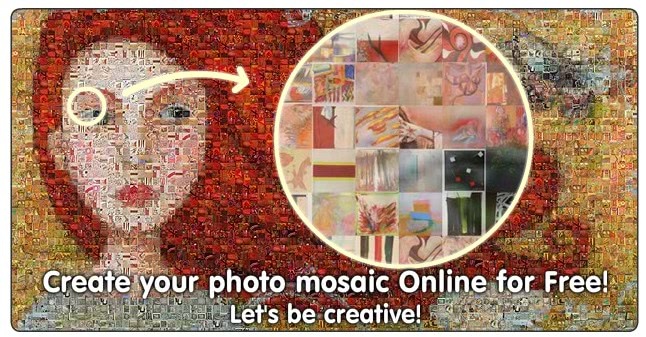 There are two differences: you need to pick the photos that make up the mosaic from your computer or Facebook, and you do not have to enter an email address to download the mosaic to your computer. May be you will be interested about other photomosaic software from Artensoft company. Just take a look for the gallery first. I found that the examples photomosaics and photocollages are truly amazing. The quality of this really is not very great! was quite disapointed. Found Mosaic Photo, even though it is not free the results were truly amazing. Well worth the money. Think will order a mosaic wedding banner for my sons wedding in a few months.